Whether it’s your first home or your fifth, selling your property can be nearly as complicated as it was buying it. One way to make the process less difficult is with a pre-market home inspection. Just like a regular inspection, a pre-market inspection will take a non-intrusive view at all of your home’s systems— heating and cooling, plumbing, electrical, etc. plus its structure, and deliver you a detailed report on your inspector’s findings. While most often buyers are the ones who seek out a home inspection, sellers who allow home and building experts into their homes before their property goes on the market could see some real benefits from the process. Here are three reasons why home sellers should consider a thorough, expert inspection before putting their home up for sale. Click here to schedule a pre-market or regular Schaefer Home Inspection. 1. A pre-market inspection may help to put the bargaining advantage in the hands of the seller. If you’re selling your home and looking for a speedy transaction, a buyer’s contingency period could hold things up. The buyer’s inspector may find issues with your property that the buyer may then ask you to fix or pay for. If you perform the inspection in advance of a sales contract, you’ll have found and disclosed issues, speeding up the negotiation process. 2. Avoid unnecessary problems down the road. A buyer’s inspector could find a number of issues regarding your property, and a long list of minor issues or overdue maintenance projects will appear overwhelming to buyers. When your inspector discovers issues that could discourage potential buyers, you’re able to fix them even before you begin showing your home. Issues you intend to address will be presented upfront rather than during the contingency period. Your inspector can provide consultation on conditions an average buyer might be concerned about, saving you money. Plus, by addressing issues with your home in advance of listing, you will add value to your property, upping your negotiating power. 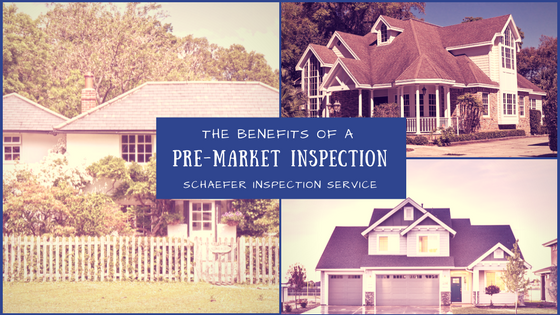 During the month of February, Schaefer Inspection Service is offering our clients $40 off a pre-market home inspection! Click here to get your coupon. If you have any other questions about pre-market or regular home inspections or would like to schedule one with us today, give us a call at 1-800-345-2776. You can also reach out to us on our Facebook page here or tweet us @SchaeferInspect.